Need to feed that chocolate craving or enjoy a cheat meal on a cold winter day? We have just the thing for you! These dark chocolate turtle graham cracker bars are delicious, affordable, and simple to make! Preheat the oven to 350 degrees F. Line a rimmed baking sheet with a silicone mat. Arrange the graham crackers in a single layer on the lined baking sheet. Put the butter, brown sugar, pecans, and a pinch of salt in a saucepan and bring to a boil. Boil for 2 to 3 minutes, stirring constantly. Pour the butter mixture evenly over the graham crackers and bake for 15 minutes. Remove and set aside. Meanwhile, melt the chocolate in a glass bowl placed over simmering water. Pour the chocolate over the toffee-covered graham crackers and spread evenly. Chill completely in the refrigerator for about 30 minutes. Cut into bars and enjoy the chocolatey goodness! 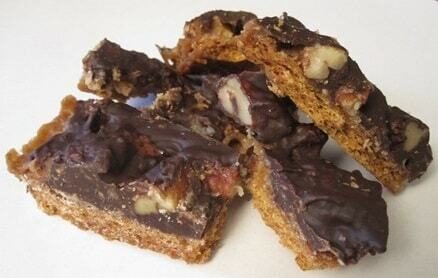 I hope you enjoyed this recipe for dark chocolate turtle graham bars on a budget. Interested in more frugal fitness free recipes?